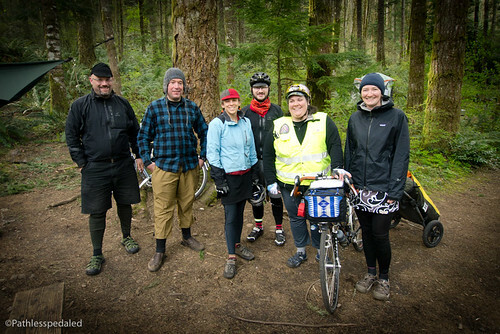 This weekend we did a S24O with CycleWild, a local non-profit group that organizes monthly trips. The trip they had planned was out to Ainsworth State Park in the Columbia River Gorge. It is a scenic ride that runs along the historic Columbia highway which has multiple points of interests and great views. When we heard that there was an actual chance we’d see the sun, we dusted off the Surlys and strapped on our camping gear. We took the MAX line out to Gresham to the start of the ride. 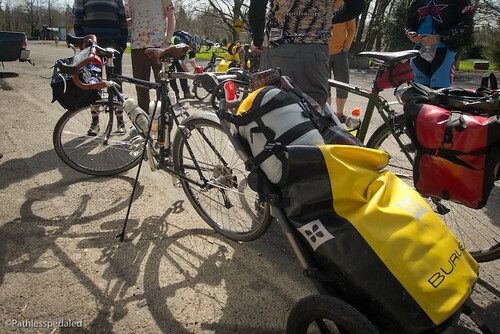 Many Cyclewild trips offer the option of either riding the entire length from the Portland city center or taking transit to the start. Feeling a little lazy in the morning we opt to take the light rail. When we arrived there was already a good group gathered at the Gresham stop. One of the things we enjoy about short bike tours is that you can do it with very little and in a myriad of configurations. Laura was trying out a front-biased load with front panniers and a Carradice, I had an Acorn handlebar bag and two rear panniers. A reader we met was using using a Burley Travoy Trailer, which we had once contemplated pairing with the Brompton. From Gresham we made our way down to the Sandy River, crossed a bridge and began the slow gradual climb to Women’s Forum, the highest point of the trip. 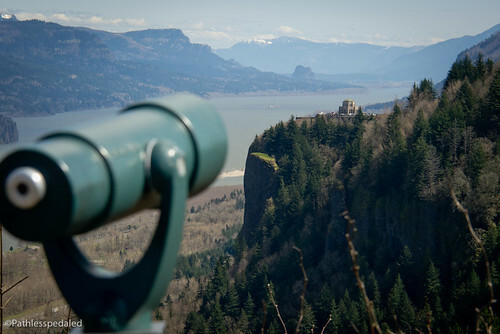 From there you can see the ponderous stone Vista House and the Columbia River Gorge. All the riding is on a small rural roads which alternated between having a small shoulder to none. Although there was a fair amount of traffic (it was Easter weekend and the sun was out!) most of the drivers were fairly well-behaved. This route is one of the more popular road rides in the Portland area so cars tend to be aware of bikes. After a windy break on Vista House, we descended down a series of switchbacks to the river. Once in the gorge, we passed a series of waterfalls which had viewing platforms. Perhaps the most popular was Multnomah Falls which has a cafe, bathroom and was crowded with tourists. After Multnomah Falls, there is a noticeable drop in traffic since most drivers tend to leave the historic highway for the modern freeway at that point. This meant a few quiet miles into Ainsworth State Park. Ainsworth is a small campground but has full facilities with drinking water and a bathroom with some really nice showers. The best sites are the walk-in sites just to the left of the entrance of the park. There are 6 sites tucked in the woods that offer a nice forested camping experience. There are train tracks not too far away though, so on occasion the illusion of being out in the woods is broken with the rumbling of a passing freight train. My favorite part about riding to Ainsworth is the ride back. Starting out early in the morning, there is hardly any traffic and you get a significant tailwind that sometimes feels like its blowing you up the hill. The slow gradual climb from the Sandy to Women’s Forum becomes a glorious coasting descent in the other direction. 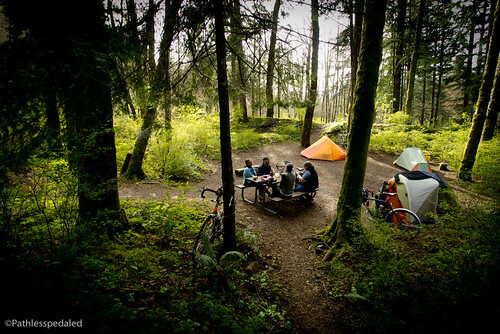 Of all the close bike camping options from Portland, Ainsworth is one of our favorites. It offers lots of opportunities to stop and take in the scenery as well as a pleasant camp experience. Its only downside is the traffic on the weekends. If you have the time, it makes a great mid-week getaway! We got to try out and handle some new gear on this trip. We borrowed a friends Marmot Haven 2 Tent. 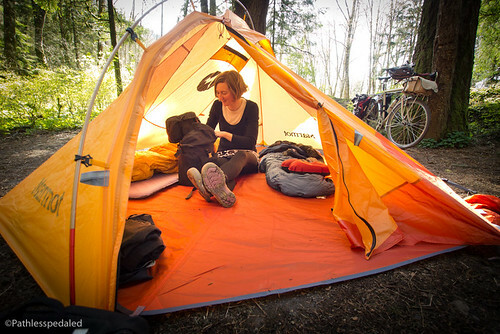 It is single pole design and is closer to a tarp tent than a dome tent. It requires staking out to hold its structure. It has an open floor design with an optional footprint (which we used since the ground was a little damp). Its biggest asset was its size! It offers 56 square feet of room for about 4lbs of weight. If you were a solo tourist you could literally park your bike inside as you slept. If we had brought the Bromptons we could have parked them folded with plenty of room to spare. The initial setup was fairly easy but required some fine-tuning to get the pitch just right. Because of its open floor design it also has no mesh, so it probably wouldn’t be our first choice for camping in really buggy areas. Another bit of gear we got to play with was the Leatherman Squirt, a small light-weight multi-tool which stores commonly used tools in a tiny package. Notably, it had a small pair of scissors, pliers, bottle opener, blade and screwdriver. It is even smaller and lighter than the Leatherman Juice that I really love. And speaking of blades, I also tried out a CRKT Ringed Razel which is a beauty of a knife. It has a chisel style blade at its tip which is great for push cuts and scraping. 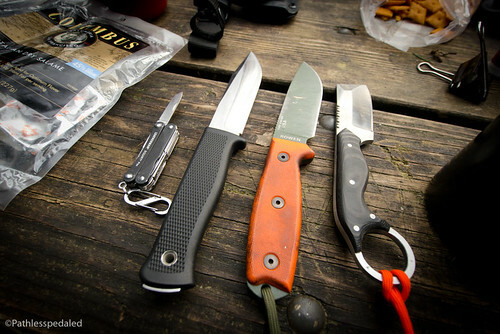 The knife is really well balanced and beautifully constructed and would make the short list for a fixed EDC knife. And of course, I can’t seem to go on an S24O without nerding out on some coffee geekery. 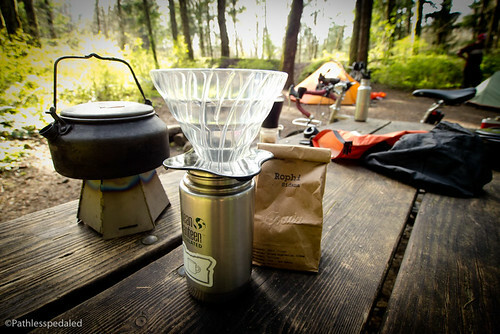 On this trip, I brought along our trusty Hario Slim Mill, insulated Klean Kanteens and a Hario V60. The Hario has been my choice of single cup brewing at home paired with a Bonvita kettle. 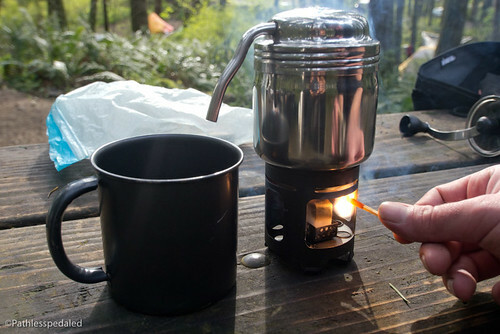 It worked great in camp though I didn’t have as much pour control with our GSI kettle. Shawn, the ride leader on this trip, showed me his really cool Esbit coffee maker. It packs down into the size of a coffee mug, but contains a Moka pot style brewer, complete with its own Esbit stove and flame extinguisher! It really is a nifty and elegant setup. Very nice trail and photos! It was such a nice day to camp out there. Good to hook up with you again, it had been a long time since your presentation during your west coast tour – 3 years ago(?) Nice web site too. I have a weakness for any product made by esbit!! Where did you find that nifty coffee maker?